Sale Price: $249.00 Highest quality at the lowest price! Made with the upstanding quality316 stainless steel. 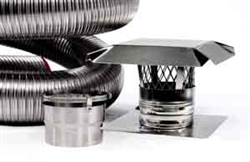 This kit is specialized for fireplace insert applications where a tee and tee end cap are not needed. This kit has been outfitted with our stove adapter designed by those in the trade. M-Flex Basic Liner Kits have a life time, transferable warranty. The Basic Liner Kit includes a UL 1777 listed and tested all fuel 316 .006” stainless steel liner, top kit, and stove adapter.